The Black Lives Matter protests that shut down two democratic candidates’ speeches at Netroots Nation highlights an emerging topic of the conversation around race. While white southerners are arguing against the idea that racism is all Dixie’s fault, white northerners are being confronted with the troubling idea that they, too, might be part of the problem. To be clear about my own identity, I am a white person born and raised in California. I’m fairly sure that makes me neither a Yankee nor a southerner, though California officially supported the north in the civil war. I have lived my entire adult life in Massachusetts. I have spent very little time in the south, though thanks to my father – who grew up in 1940s Florida – I ate a lot of grits growing up. All of that is to say that I am in no position to judge the south. Certainly recent events – such as our nation’s president being greeted by Confederate flag wavers in Oklahoma – indicates that there is important work to be done around racism in the south. But that’s hardly enough to write off the entire south, and only the south, as our nation’s problem. All of that is to say: stereotypes of white, racist southerners help nobody. The south should indeed confront its racist past and present, but it is wrong to scapegoat the south as the home of all our nation’s racism. Northern racism – or liberal racism or progressive racism, if you prefer – is just as real. It is somehow more proper, a fine veneer of inclusion over a troubling racist interior. This northern racism is arguably more insidious: a norther says the right things and goes through the right motions. But all the while, the system pushes to ensure segregation and white dominance. Historically, this has put white northerners in an enviable position of avoiding fault: They wanted the meeting to be inclusive, its just that only white people showed up. The dutiful liberal heaves a sigh. What could be done? The reaction to the interruptions of Gov. Martin O’Malley and Sen. Bernie Sanders at Netroots reminds me of this type of liberalism. That is the response of the white liberal. Sympathetic to the cause, but not to the method. Wanting there to be a chance, but not willing to work for it. Yes, indeed, being silenced is frustrating. Those who authentically commit themselves to the people must re-examine themselves constantly. This conversion is so radical as not to allow of ambiguous behavior. To affirm this commitment but to consider oneself the proprietor of revolutionary wisdom – which must then be given to (or imposed on) the people – is to retain the old ways. The man or woman who proclaims devotion to the cause of liberation yet is unable to enter into communion with the people, whom he or she continues to regard as totally ignorant, is grievously self-deceived. The convert who approaches the people but alarm at each step they take, each doubt they express, and each suggestion they offer, and attempts to impose his “status,” remains nostalgic towards his origins. This entry was posted in Citizens & Civil Society, Civic Studies, Justice on July 20, 2015 by sshugars. As someone who grew up in Massachusetts and is proud of being from the birthplace of America (‘spirit of Massachusetts’ and all that), I appreciate this post. It can be hard to admit, but my own home state has an incredible and horrible history of racism. Look at my beloved Red Sox for example. It was never ‘the Curse of the Bambino’. It was ‘the curse of Jackie Robinson’. They were the last team in MLB to sign an African-American player because Tom Yawkey was an inveterate racist. When Robinson tried out, Yawkey’s response? “all right, get those [expletives] out of the ball park.” And there is no doubt that many Boston fans shared the sentiment. 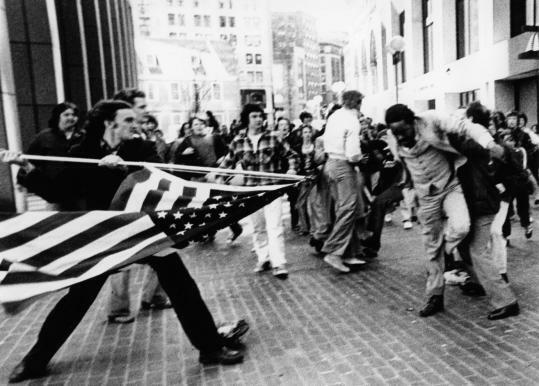 Boston has a proud history as a liberal and progressive city, and deservedly so. It led the way in the Revolution, it led the way in abolition, it led the way in women’s rights and gay rights. And yet, it has a sad and dark history of racism, though I think today there is progress that has been made. But that progress can’t make up for some of those darker events.